“The biggest change in a generation” is how the new Office for Students (OfS) chief executive Nicola Dandridge has described the proposals for a “risk-based” system of higher education regulation outlined in a “suite” of consultations by the Department for Education (DofE). UK HE blog and think tank WonkHE has helpfully collated the 500+ pages and nine documents into a single downloadable bulk file, and has summarised some of the key points in a number of posts. 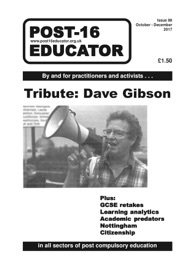 As this blog is aimed at activists and trade unionists, we have made no attempt to analyse these consultation documents in detail, and it would be a futile project competing with WonkHE on the level of policy analysis – we know that trying to out-“wonk” them would only end in failure. So we thank WonkHE for undertaking this vital task, and merely point out some key areas of interest below. The main focus for the consultations is the role and power of the new OfS regulator, created as part of the long awaited Higher Education and Research Act 2017 – now known simply as HERA. The OfS will have bailiff-like powers of inspection with regards to under-performing institutions. Rather than yearly inspections, however, as was the case with the Quality Assurance Agency (QAA), the new risk-based system proposes that institutions would only be subject to inspection if metrics-based indicators suggested they were falling behind minimum standards. If institutions failed to raise their game, the OfS could also impose financial sanctions. The OfS will stamp institutions with the mark of quality if they perform well on a range of indicators, most importantly the Teaching Excellence Framework (TEF), which is no longer tied to fee increases, and basically leave “approved” institutions alone. Despite issues raised by the “summer of discontent”, and proposals floated by Jo Johnson, there will be no specific measures to address excessive senior management pay or to protect academic freedom. However, the government suggests “a freedom of speech code of practice” could be created, “setting out the procedures which members, students and employees should follow in relation to meetings or activities, and the conduct which is expected of those individuals”. Although a bit weak, this would no doubt be welcome among activists and trade unionists, and if this is related to “compliance”, as the DofE indicates, then this could be a useful tool in the fight against the erosion of academic freedom. Similarly, proposals to address “predation” (see David Ridley’s article on this blog putting the VC pay debate into context) fall short of anything directly useful, for example governance reform that would require staff and student representatives on remuneration committees. In future institutions will be required to publish “value for money” statements informing students exactly how their money is spent, with the OfS able to conduct “efficiency studies” where there are concerns. Despite the overwhelming evidence to show that the ‘quasi-market’ has failed, the government also seems to still believe in the myth of competition driving up quality – the “rising tide that lifts all boats” as David Willetts once poetically put it: “Once meeting a high minimum standard, the OfS will leave autonomous institutions to flourish on their own terms and will instead shape the market by supporting effective demand (in particular, through effective provision of information)”. As Andrew McGettigan has consistently argued (watch this space for an report on the evidence he gave to Parliament last week), the income-contingent loan system means that the price mechanism will never work – as students never pay the headline price, and pay nothing up front – and the complexity that this system introduces baffles even the most accountancy-literate Member of Parliament, let alone 17/18 year old students. David Morris concludes that these proposals represent “Browne in the bin” – a reference to the most explicit expression of the marketisation of HE, the Browne Report, which vehemently argued against creating “bureaucratic and imperfect measures of quality”. Its principles have now been abandoned, even if the rhetoric remains: “Fast forward to 2015, and Jo Johnson felt impelled to introduce such a “bureaucratic and imperfect measure for quality” in the form of TEF,” Morris points out.